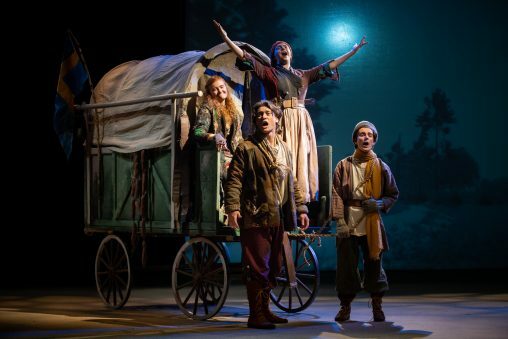 Wright State University Theatre continues its 2018–19 season with Bertolt Brecht’s landmark antiwar drama “Mother Courage and Her Children” from Feb. 13 to Feb. 17 in the Festival Playhouse in the Creative Arts Center. Performances are Feb. 13 and 14 at 7 p.m.; Feb. 15 and 16 at 8 p.m.; and Feb. 16 and 17 at 2 p.m.
Tickets are $25 for adults, $23 for seniors and $15 for students. Tickets are on sale through Box Office at (937) 775-2500 or online. The production is part of a yearlong examination of “The Cost of War,” featuring workshops, readings and public lectures focusing on the causes and impacts of war, from the devastating Thirty Years’ War in Europe in the early 17th century to modern times. The production is supported by CELIA, Wright State’s Ohio Center of Excellence for Collaborative Education, Leadership and Innovation in the Arts, and the 21st Century Peace Literacy Foundation. “Mother Courage” has been praised by scholars and critics as one of the most influential dramas of the 20th century. It considered by many to be among Brecht’s best work and one of the most powerful antiwar dramas in history. Brecht’s “Mother Courage” was subtitled “A Chronicle of the Thirty Years’ War” and depicts the travails of a mother and her three children striving to get by during a pointless war in the early 17th century. Mother Courage works to profit from the war by selling provisions to soldiers as the conflict pulls her family apart. For this production, Wright State Theatre received permission to incorporate music by German composer Paul Dessau from the original 1948 Berlin production. John Lavarnway served as directing coordinator of the Wright State production, based on direction from W. Stuart McDowell. Sets are designed by Don David, lighting by Autumn Light, costumes by Elizabeth Bourgeois, properties by John Lavarnway, sound by James Dunlap and production stage management by James Dunlap. Musical direction is provided by Steven Aldredge, with musical supervision by Jim Tipps. On the stage, Mother Courage is portrayed by Casey Borghesi, with Kaitlyn Campbell (Kattrin), George Heddleston III (Eilif), David Bays (Swiss Cheese), Mark Anthony Howard (Chaplain), Joe Green (Cook) and Mackenzie Kasbaum (Yvette). The Male Ensemble features Ethan Evans, Jake Jones, Nicholas Martin, Thomas Sheffer and Christopher Wells; the Female Ensemble features Shae Bickel, Julie Deye, Tina Hohman, Sophie Kirk and Margo Russ; the male swing is Michael Fried, and the female swing is Mady McCabe. The Wright State Theatre season continues with “If/Then” in the Herbst Theatre from Feb. 22 to March 3, and “A Little Night Music” in the Festival Playhouse from March 21 to April 7.